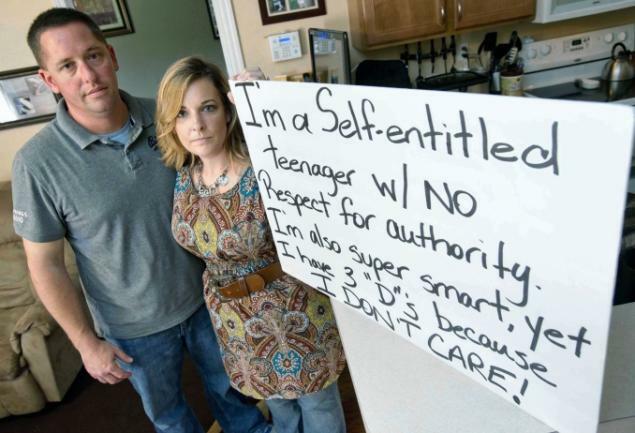 The New Parenting Trend is Online Public Shaming: Is it Helpful or Hurtful? Every time someone shares the photos, I squirm. The tag lines of "Parenting Done Right!" are followed by hundreds and thousands of likes, shares, and comments giving virtual high fives. Uncomfortably, I scroll away trying to ignore them as they continue to populate my Facebook feed. You've seen them: photos of children holding signs publicly announcing their latest "crime". Their parents are proud of their own actions, smuggly telling the world they have found the cure for disrespect/shoplifting/smart mouthing/smoking pot/fighting/bullying behavior and that cure is public humiliation. They put their child in front of cameras, splash them across the internet to the applause of the masses. It's called parenting done right. Look at the pictures and not the signs. What do you see? I see the faces of children—tear stained, empty eyed. They stoically stare straight ahead, obviously trying to shut out what was happening to them. They answer the reporters in monosyllabic phrases. They are, in a word, defeated. I know that look. I know that feeling. I think back to the time I spilled a drink on a customer in my early days of being a waitress. The cold beverage slipped from a badly balanced tray and dumped ice and water on a man in the booth. Furious he jumped to his feet and started yelling at me. Poking his finger in my direction, he called me clumsy, stupid, an idiot. I felt heat rise up my chest and to my cheeks. I swallowed tears of shame and nodded my head, doing anything to make the tirade stop. There is not an adult out there who has not been shamed in front of others. Knowing those feelings, the emotions and damage they can cause, I'm having a hard time seeing this as parenting done right. We read The Scarlet Letter and wonder how a society could brand a woman so. We walk around stocks in museums and think how far we've come as a culture. And we have come a long way. Now, instead of a village of a hundred or so seeing a person publicly shamed for their transgressions, we allow hundreds of thousands of strangers to see our child humiliated. While I've never parented a teenager, I can't imagine this sort of punishment builds a relationship of mutual respect and trust. I've always been in the "live and let live" camp when it comes to the parenting decisions of others. This, however, seems to border on abuse and bullying – a word I don't use lightly. 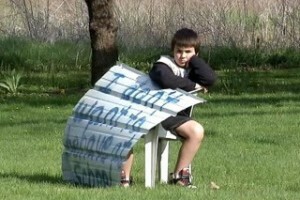 What will the child learn by standing on a street corner with a sign proclaiming he or she skipped class? Will they learn to go to school for the love of schooling? What about the sign outlining a child's lack of respect? Will they learn to respect authority by wearing a sandwich board on a sidewalk? And if they do provide respectful lip service are they doing it out of fear or because they honestly understand how to respect others? In a recent post, one blogger has the right idea: parent in private and praise in public. I think this is brilliant advice and something I'll be using in the years that come. What do you think? Is shaming a child a fitting punishment? Single & Longing to Be a Mom: Should I Make a Baby Pact with a Friend?CVS Includes Plan B Contraceptive in its Valentine’s Day Display and Feminists Whoop!